Sachin Gaur is an award-winning software engineer and world-class expert in mobile security. 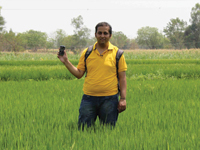 In 2010 he cofounded the technology collective MixOrg, which aims to develop apps to help people at the bottom of the pyramid -- people like the many millions of India's poor farmers whose lives are often blighted by multiple problems. LIFE follow Sachin as he heads off to Andhra Pradesh to meet farmers and hear first-hand about the major obstacles they face in their lives -- from changing weather patterns and unreliable rainfall, to rising costs of seeds and fertilizers. With a firm grasp of some of their real-life problems, he's ready to start working on a "Life App" to help spread farmers' ideas. "Mobile Harvest is quite a splendid short video in a splendid series. Given their length, they are ideal for use in the classroom, where tech-preoccupied students may grasp the ideas of technology and of culture. I consider these films an excellent introduction to cultural diversity, the modernity of indigenous peoples, and the positive power of technology...Level/Use: Suitable for high school classes and college courses in cultural anthropology, anthropology of development/globalization, anthropology of technology, and Asian studies, as well as for general audiences."